Last Saturday nights supper consisted of raw daylily, sauteed daylily, batter fried daylily, and batter fried poke stalks. 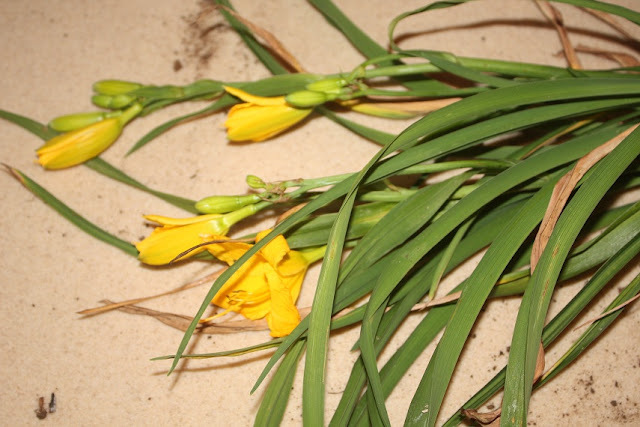 The famous "Orange Daylily" (Hemerocallis Fulva) is a common plant here in the south. So is the "Yellow Daylily" ( Hemerocallis Liliosphodelus). Native to Asia and introduced here from Europe, it grows at old home sites, in roadside ditches, fields and wasteground in temperate climates. As with any plant, you need an expert forager with you to help you properly identify what you are about to eat. Some edible plants have poisonous look alikes. The day lily is one of them. Iris looks like the daylily and it is very poisonous. Also, there are some "strange" hybrids out there now whose leaves resemble nothing like the native daylily. I have found no written reference that says all hybrids are edible. I want to briefly explain that eating wild plants is not for the inexperienced. There are plants that look and taste good but will kill you. There are plants that don't taste as good that are very nutritious. However, the hobby of learning and identifying wild plants is good to have in my opinion. It is not something a person can learn over night. There may be edible plants right in your yard and there could be a poison one such as hemlock which a piece of the leaf the size of your fingernail will kill you. Learning to identify such plants is important. If you have young children you would not want them playing around hemlock and that plant does grow all over the south. However, on a more positive note, there are thousands of plants that are completely edible and safe. 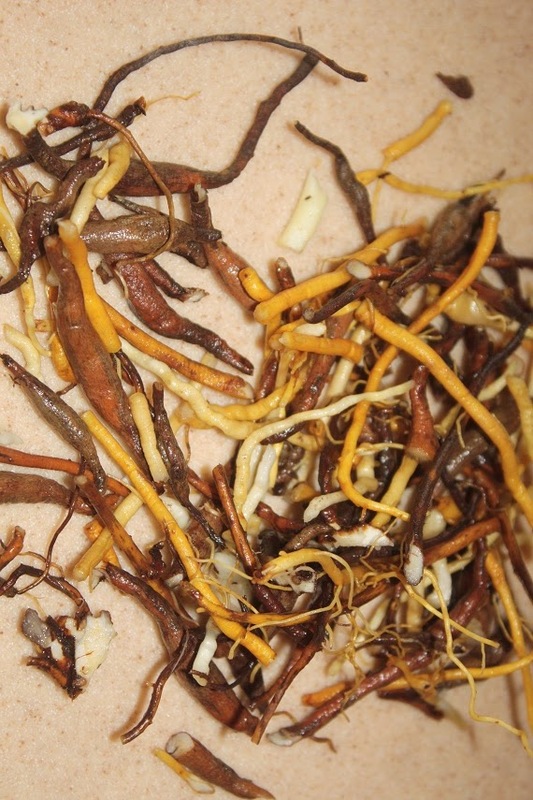 Many of them even more delicious and more nutritious than our modern cultivated plants. Fresh out of the yard. 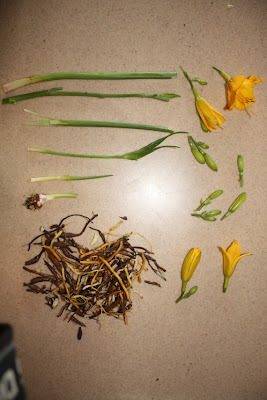 All of the daylily plant is edible. 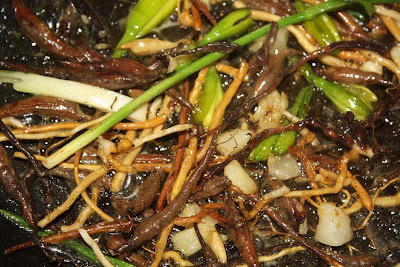 Some sources say raw, others say the roots need to be cooked. The young stems tender. The older leaves are too really too fibrous to eat and some sources say the older leaves are hallucinogenic anyway and could make you sick, so stay away from them. 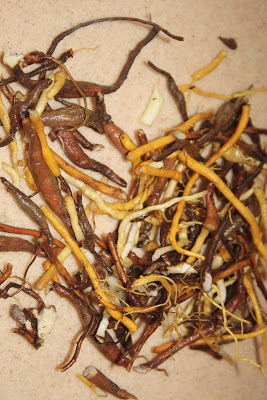 The roots and tubers have a "nutty" flavor. Some sources say to cook them, I both cooked and ate raw. The flowers can be eaten raw or cooked and have a sweet flavor. 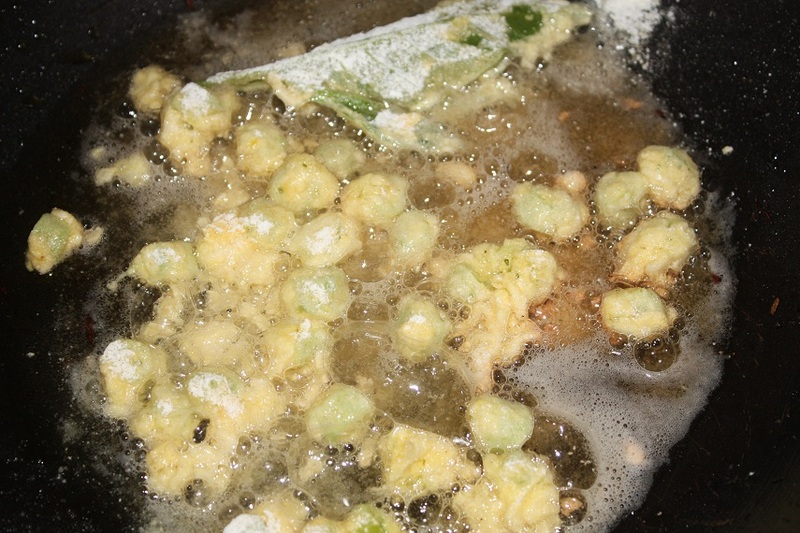 I dipped them in egg, corn meal and then batter fried them. 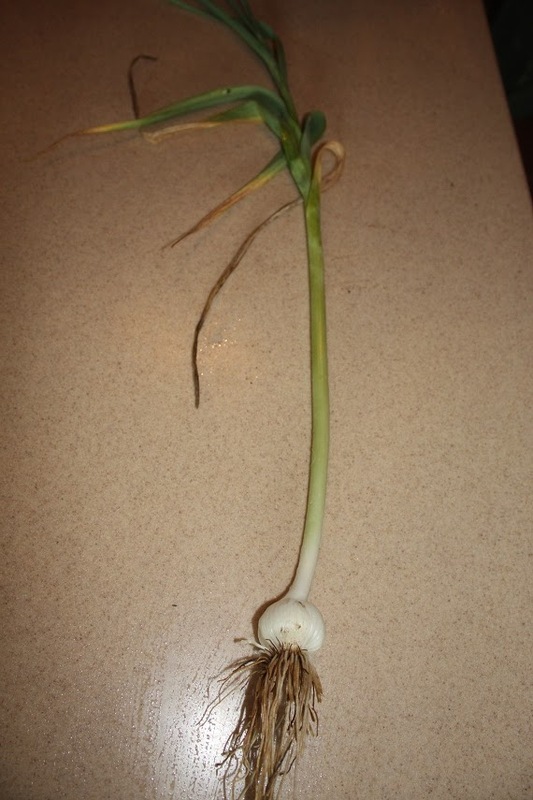 The garlic came from my back fence. Some of the wild garlics and feral garlics will grow with zero maintenance just about anywhere. This was transplanted from an old feral stand that is over 50 years old. It grows well without maintenance even in droughts and kneehigh grass. 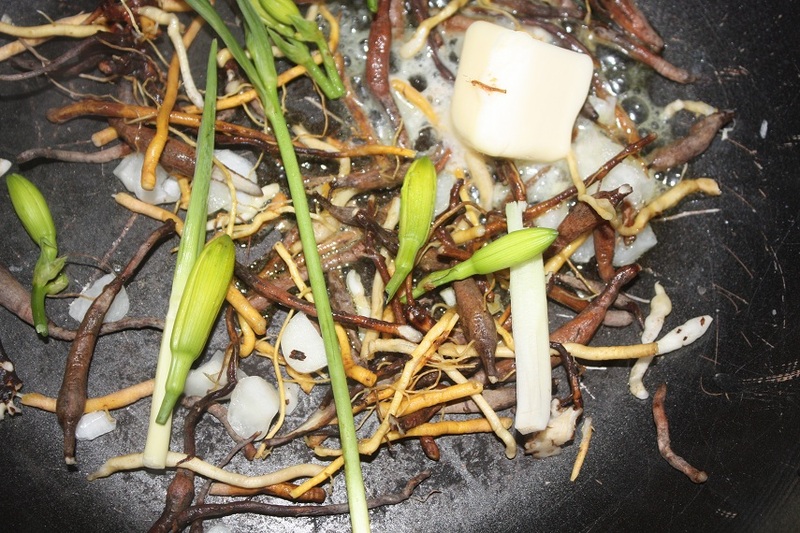 A little butter to help sautee the roots, young stems and flower buds. I mixed a little feral garlic among everything. 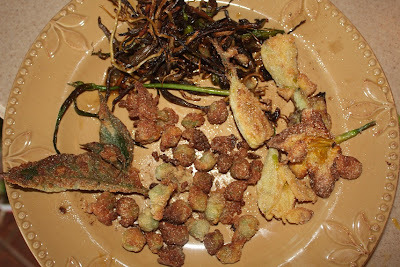 Fried polk stalks. Don't try this yet as it is poisonous until prepared properly. Prepared right it will sustain you and temp your tastebuds to eat more. 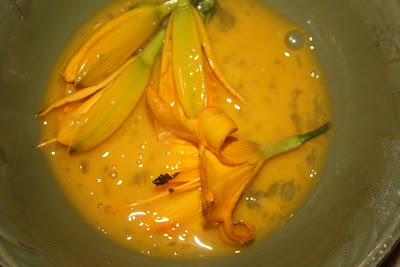 Dipping the Daylily flower buds in egg before batter frying. An entire plate of food for free (except the one egg and a little corn meal). It took me 5 minutes of walking outside to collect this free meal and there are at least 15 more things growing around the house that are ready to eat right now. There will be more diversity later as some of these things become unavailable. I mentioned poke above. I have been eating poke for almost 25 years. There is a special preparation used for poke leaves and stems so stay away from it until you know what you are doing. I will do a full article on poke at some point. It is a plant with a lot of history. Also, keep in mind that any time a new food is introduced, there is a chance of an allergic reaction. This goes for any food. Some people are allergic to peanuts, some strawberries, some coconuts, so the same rule applies for any "wild" food newly introduced. My suggestion is to not try any new food except in very small quantities at first. Check several sources. The internet is really not the best source as there is a lot of "missinformation" out there.